This entry was posted in USA Immigration and tagged Temporary Agricultural Worker Visa US work visa USA H-2A visa Work in USA on December 9, 2017 by Blog Author. The debate about immigration issues in the USA has highlighted the truth regarding the weakness of the food system. Presently there are 70 percent farm workers who belong to the undocumented immigrant category. The failure of these workers is a calamity for the existing system, and those who seek strict borders feel that the labor supply in the agricultural sector will move to lawful workers who experience the appropriate channels and get the visa. 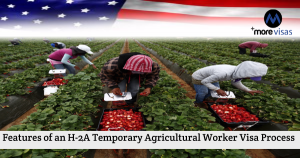 The process of getting an H-2A Temporary Agricultural Worker Visa, as a legal option for overseas workers, to arrive in the country, to do farming work, is very complex. The process is bureaucratically frightening and needs to be started by the American employer. A lot of fees and paperwork are involved, and it can be easily exploited. The H-2A visa program is similar to the contemporary form of agreed slavery, in the opinion of some people. Applications for such visas are permitted by the Department of Labour, and no limit exists for the number of visas, to be issued in a year. Around 70000, H-2A visas are issued every year, which makes it hardly 3.2 percent of the farm workers of the country. The rights regarding employing overseas workers are given to employers after all efforts to recruit an appropriate local workforce, like advertising online or in newspapers of the locality are over. The authorities find it difficult to evaluate, how the employers employ locally. Some administrative components need to be begun ten weeks prior to the date when workers are needed. Many crops are harvested in a short time after ripeness, and it is not possible to forecast whether the weather will delay or speed up the date of harvest. Employers are required to make payment of fees and agree to give wide-ranging information about job hiring profile and labor needs and fill the forms. The paperwork is a process which needs repetition every year because such visas are meant for temporary workers and one year is the highest duration allowed in it. Recruitment is done by overseas labor agencies. Workers belonging to more than 60 countries are eligible to get H-2A visas; nine out of ten stands issued in favor of Mexicans. The law in Both USA and Mexico prohibits labor organizations from levying any charges to workers for getting a visa and the employer based in the USA should make a payment to the contractors. This rule in not enforced and workers are charged fees, like visa payments by the recruiters. A survey said that 58 percent workers had to pay the recruitment fee, of $590 per head. The workers are defenseless to exploitation and fraud. The work contracts are not shown to the workers, and some of them said that they had paid a non-existing fee for the job offer. Administrative sections of step two require Form I -129 which is an application for a Worker (Non-Immigrant), given to USCIS and it establishes the number of visas to be given to the applicant. The worker housing is inspected to ensure its conformity to the requirements of the Labour Department. All the Farmers in this program must follow several contractual requirements but agricultural employers maneuver the system and take an advantage. They need to organize transportation to the USA, to the workplace and back each day and one time in a week to visit grocery stores. Employers must continue to recruit American workers for 50% of the time, for which the overseas workers are hired, but the employers, do not hire Americans after they bring workers from abroad. A major part of the work given must be offered by employers, but the workers are sent home at an early date and no compensation is paid to them. Workers are restricted and cannot do other jobs. This makes them not to make a complaint regarding their treatment and exploitation. Their children and spouses can accompany them, though they are not entitled to working, and there is no obligation from the employer to offer transportation or housing to them. Employers are eligible for renewing these visas for 12-month for 3 years, but later the worker needs to return to the native country for 3 months before being eligible to get such visa.